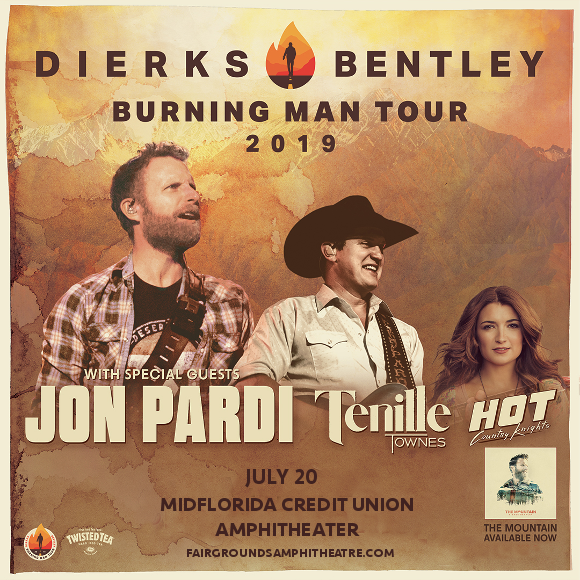 If you didn’t manage to catch Dierks Bentley last year with his tour promoting “The Mountain,” you’re in luck!! The nation’s favorite country singer is back again in 2019, and this year, he’s joined by Jon Pardi and Tenille Townes!! They’re hitting the MidFlorida Credit Union Amphitheatre on Saturday 20th July 2019 – be there! Grab your tickets NOW before they disappear – as if last year is anything to go by, they will! What are you waiting for?? Grab your tickets and get ready to soak up those unique vibes on July 20th – it’s going to be amazing! !